Tuscany's countryside is what you see in the postcards: gentle hills with endless rows of vineyards and olive groves which are in Chianti but also spread out in other areas of the region or the low hills of the Val d'Orcia with rows of cypress trees and golden rolls of hay in the fields at the end of summer. How about the fields of sunflowers? 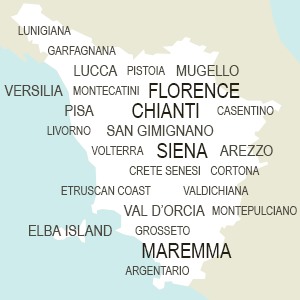 You'll find those spread out between Florence all the way down to the Maremma. A stay in the countryside is exactly what you need when you're thinking of staying in Tuscany. If you're coming to Tuscany and want to stay out of the city and enjoy the beautiful panoramas that Tuscany has to offer, you will have a tough choice since there are so many options! The most common offering is staying at an apartment in a renovated Tuscan farmhouse or villa, where you'll find large gardens and often a swimming pool by which to relax and enjoy some Tuscan sun! An apartment offers the chance to cook some meals "at home" giving you a chance to settle in and relax in the evenings, eating out when you feel like it. These often require weekly stays, particularly in the summer. A hotel or small B&B, also often in renovated countryside estates, offer instead the chance to have your breakfast ready before you set off to explore Tuscany. If you have less than a week in Tuscany, these offer the perfect option to enjoy Tuscany and its countryside for a few days!